Winter’s icy chill has finally worn off. We’re lucky enough to be experiencing some warmer weather down here in the Dallas metroplex, but all that spring rain can come with heavy consequences for your home. If you live on expansive clay soil like many residents of the Lone Star state, excessive water can wreak havoc on your home’s foundation. It causes fissures, cracks, and other problems over time. In an average year, damage from expansive soils costs more to fix than floods, hurricanes, earthquakes, and tornadoes combined. It’s a serious problem. In order to mitigate damage, you need to learn how to stabilize expansive clay soil and what steps you can take to fix damage once it’s been done. If you want to stabilize expansive clay soil, you’ll need to know exactly what it is and how it can affect your home in different situations. 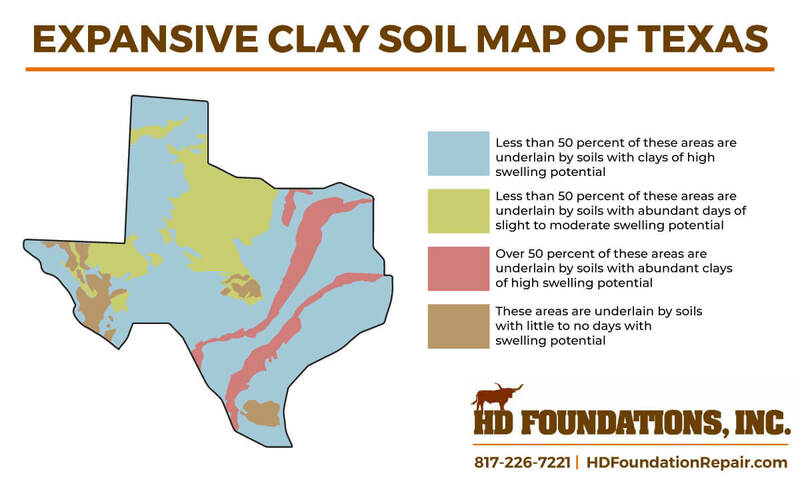 Expansive clay soil in Dallas (and heavily throughout Texas) contains smectite clay. Smectite causes the soil to swell and shrink depending on its moisture content, disrupting the earth around it and potentially harming your home’s foundation. In order for it to remain stable, it must retain constant level moisture. With loamy or sandy soil, rainwater will drain out instead of being absorbed. For clay soil, it’s a different story. As it rains, water is absorbed into the soil. The excess water causes the soil to expand and swell. Swollen soil puts intense pressure on a home’s foundation, causing gaps and fissures to appear quickly. We all know about those notorious Texas dry spells. What if it doesn’t rain? You’re not in the clear. Clay soil not only expands with extra moisture, but it also shrinks down when that moisture disappears. Soil shrinkage leaves extra room between your foundation and the soil around it, destabilizing your home and leading to big cracks in the foundation. North Texas has a huge swath of clay soil running through it, making this a bigger problem for our residents than for those living in other states. If you live in the Dallas-Fort Worth area, chances are you might be situated right on top of it. What can you do? You can take measures to stabilize expansive clay soil in Dallas yourself by adding various materials to the soil which act as agents to diminish the shrink-swell potential. It is imperative to consult a professional before adding materials to your soil so that you’ll know which methods will help and which will not. Employing calcium for expansive clay soil treatment is an effective way to stabilize the soil. Using lime (calcium oxide) works well because it changes the mineral makeup of the clay, reducing the potential for expansion and shrinkage. Lime can be mixed with fly-ash and water for the most effective treatment. Consult a professional before using calcium treatments so you’ll know the proper ratios to use. Fly ash by itself also an effective expansive clay soil treatment. Not only does it reduce the potential for shrinking and swelling, but it also helps to get rid of moisture which is already trapped inside. Fly ash is an excellent choice if your soil is subjected to large amounts of water. It also strengthens the very composition of the soil, creating a stable environment for your foundation. Portland Cement helps stabilize expansive clay soil by increasing its dry density and durability. It also has the potential to improve the load-bearing capacity of your soil, making your property and your home a stronger and more stable environment. In many cases, getting professional help will prevent future problems as well as take care of any damage already sustained to your foundation. You should always have professionals keep a close eye on your foundation, especially if you live in North Texas. They’ll be able to tell you if there are any issues and how serious they are, as well as give advice on how you can fix them. The foundation repair contractors at HD Foundations can help. We’ll provide professional inspections of your home’s foundation to determine if it has been damaged or affected in any way by expansive clay soil, and can provide recommendations to resolve any found issues. Even if you employ the proper treatment, foundation damage may occur due to expansive clay soil. If a professional determines that you have an issue, don’t hesitate to begin repairs. Oftentimes, this entails installing steel or concrete foundation piers for support. This will restore the strength to your foundation, repairing damages and stopping them from spreading to other parts of the home. If necessary, we can also install surface drains or French drains at key points along your property to prevent water from seeping into the ground and damaging your foundation. Expansive clay soil in Dallas and the surrounding areas can be a real headache for homeowners. Fortunately, HD Foundations can help guide you in preventing foundation damage in the future, or fixing existing damage. Ready for a consultation? Call us at 817-226-7221 or visit our contacts page to get started today.